Sarah Ann Watts, Heart of the Kingdom. Silver Publishing, 2011. 5000 words. ASIN B004MDLLZ4. £1.44 / $2.28. 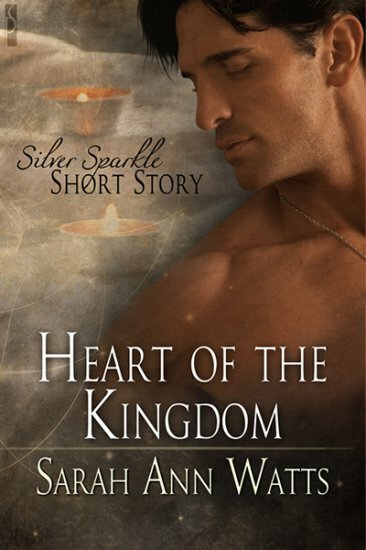 The cover art for ‘Heart of the Kingdom’ made me want to swap this magical fantasy romance for something on the review list with subterranean journeys instead. I wondered whether the Fabio-lookalike on the cover was asleep or simply dreaming! But I was raised not to judge a book by its cover so I persevered. I was surprised to find a letter from the publisher on the next page, thanking the reader for not pirating the author’s work. This appeal to readers is quite sweet; certainly a more pleasant approach to the music industry’s stance on DRM. ‘Heart of the Kingdom’ began on page 6 out of this 30 page e-book and as I started to read I wondered how so few pages could contain enough to keep a reader satisfied. But as I read on I found that the form of this narrative is moot. This is a nicely crafted story that works very well. It is compelling and different from any of the romance genre tales I have read before. The e-book tells the story of Elynas, a former king and servant of fire and Melior, a knight and creature of water. Their innate elemental natures prohibited them from ever being lovers. But Elynas is paying for his efforts to save Melior’s life with the aftershocks of a spell cast on him by his wife. The language is economical, with plenty said in very few words. The reader gets a glimpse of the characters and what they are up against. The narration takes the second person’s point of view; this technique alone makes the story stand out. The heartbreak of lost love is intimated beautifully; the reader can really feel the sense of devastation as it is built up in the narrative. My only issue with this e-book is how it has been presented. The cover really did put me off and it would be a shame if that happened to anyone else, since this story is a great read. The author tells me this is the stock cover for romance stories in this collection, so we shouldn't expect any actual correspondence with the content. Interesting idea, publishing short stories with their own cover. I wonder how that works from a reader/browser's perspective... make your own anthology? I have to admit, I think 'stock covers' show a publisher's lack of respect for an author's story. Down with that sort of thing! Oh dear, I fear I've opened a can of worms here, and I don't really know enough about the press and their circumstances to defend them. I agree that stock covers look shoddy, but bear in mind that this is a short story of about 5,000 words, sold as a free-standing item in what is an experimental publishing model (I believe discontinued for items this short--they're going to focus on novellas and anthologies in future). Given the number of short stories released in this way, and the minimal profit margins you'd expect per title from such items, I doubt any press could afford to commission unique artwork for each "book" cover, so a stock cover--one representing the whole romance range, or virtual anthology, if you like, to which this piece belongs--becomes more understandable. Maybe someone from the press will come along and set us straight? An exclusive cover will be used for ALL manuscript with a word count over 15,001 or more. You need to consider quite a number of things. Here's a quick breakdown. Editing Fees for a 5k manuscript is up to $100. Cover art is set at one price of $250 per cover. A 5k book sells for $1.99. In order to cover only the expenses of publishing the book you would have to sell 176 of a title. Depending on an author, this doesn't always happen. I find this post very interesting because I started self-publishing in March and by April had transformed that into an indie publisher (Greyhart Press). I have faced exactly the same problem: artwork is time consuming and expensive. However, I absolutely feel that one of the advantages of simple and cheap publishing model for e-books is that short stories can now be considered on a par with novels, and so deserve their own covers. My Kindle treats short stories and novels exactly the same, and so do I. In the old world of printing, binding and distributing on paper, stories had to be bundled together, cheapening them. (Although look at Pendragon Press and their chapbooks as an honourable exception). Now, with single-story e-books, readers can be the editor of their own anthology. In fact, that's one of our ambitions and to that end I am working at developing a small library for each author. In the case of my Greyhart Press, I do the editing and artwork and take them very seriously because we would be toast if readers thought either was rubbish (except if I wanted to publish any of my stories again, I would get someone else to edit it). The quality of the writing on its own is not enough. I can't draw. I did teach myself the rudiments of the graphics package, Gimp, and spend long hours searching sites like Shutterstock for images I can purchase and then mash together artistically (hopefully). When it works well, I get the buzz from seeing the author's face when they see the cover art with his or her name on the front (and no one else) and artwork that matches their story. But I take Leiland's point. I have yet to prove that sufficient numbers of people would pay 99c/70p for a single short story. I know that is worth paying for a good read, but there is such a flood of novels and story collections for 99c or less that it's hard to convince other people. It would be tempting to escape up the food chain to novellas and novels, but I love short stories so I won't. Does anyone reading this agree that single short stories at 99c/70p is too expensive?